I gaze upon the massive reservoir with the snow capped mountains looming in the background. What a view! I lean over, touching my toes, stretching my hamstrings. I lean against the sign watching dogs run along the bank, darting in and out of the water, basking in the warmer temperatures. Next I push against a tree, stretching my calves. Finally, I take a deep breath and set off on the rim trail along the reservoirs’s shores. Having signed up for the famed BolderBoulder 10k road race on Memorial Day, I’ve spent the last 10 weeks running 3-4 times a week. As someone who doesn’t particularly love running in the first place, I have to use every incentive possible to motivate myself to go for training runs. Music has been helpful as I have loaded upbeat tunes on my iPod. Trails that offer scenic views also seem to help. I usually run in Boulder on the flatter trails crisscrossing Boulder, where I can run at a more comfortable 5400 feet. The old training adage says to “sleep high, train low.” Living at 8200 feet, the sleeping high part is easy. 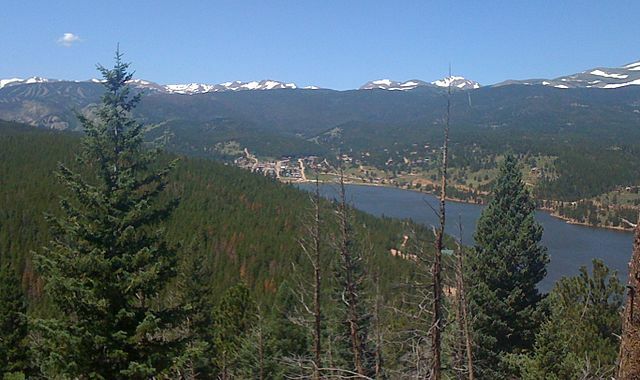 The running low part requires a drive down the hill, to find trails in and around Boulder. One issue that has concerned me as I ramp up to longer distances this time of year is the escalating temperatures. I don’t do heat well, and living in the high mountains does not acclimatize me to hot temperatures either. Fortunately, most of the month of May has felt more early spring than early summer, at times even feeling almost wintry. I much prefer running in Boulder at 40 degrees than 80 degrees. But this day was different. For the first time, temperatures crept up towards 80 down on the plains, discouraging me from sticking to my running schedule. So instead on this day, I’ve decided to run up in Nederland where the temperatures are a good 15 degrees cooler. I knew the altitude could make it tougher, but I’ve been running hard down in Boulder, how much harder could it be? As I push off, I realize this is not going to be easy. The first thing I notice as I’m running the trail is my breathing feels out of whack. Instead of the rhythmic breathing I seem to have while running in Boulder, I feel as if I’m periodically gasping for air. I try to take deeper breaths, consciously filling my lungs, and breathing out in a measured way. I also shorten my stride to slow down my pace. After the first half-mile, the pain eases a bit. Uh oh, there’s a hill. I’m determined to keep it up and I chug up the hill — it doesn’t seem so bad, maybe this is ok. Then I reach the top and the flat, and all of the sudden I’m gasping again. They say there’s 30% less oxygen at 8000 feet than sea level, and cresting this hill, while trying to keep up my pace has brought this point home. Still I keep my legs moving, even though they feel kind of heavy, running along. A large bird, perhaps a red-tailed hawk soars overhead, and though I’m feeling a bit fatigued, the scenery makes me feel grateful and I keep moving. Finally I see a mileage sign, only a 1/2 mile to go. I try to get my legs moving faster, feeling a my heart rate escalating and my breathing speeds up yet again. Finally, I see my car and the sign for the end of the trail and I come to a stop. Bending over, struggling to catch my breath, I’m feeling the effects of this high altitude run. The extra 3000 feet do make a difference as I feel incredibly tired. Hopefully the results next Monday will make me feel as if was all worth it.